The next time you see a DeLorean in person, it might be soaring overhead just as the namesake did in the final scene of Back to the Future. 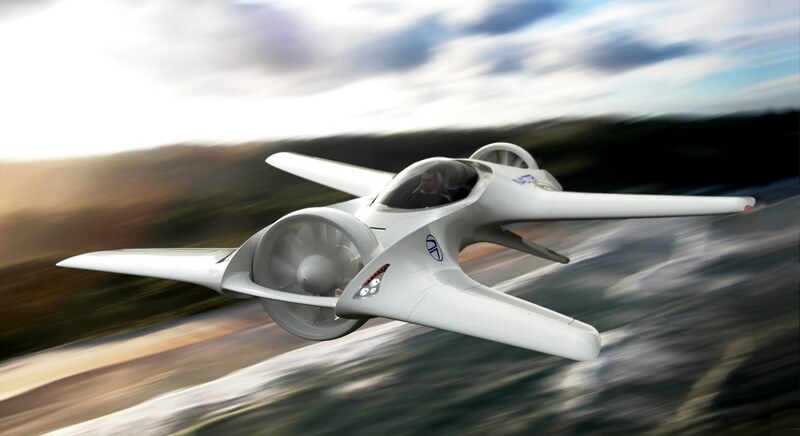 DeLorean Aerospace over the weekend unveiled the DeLorean DR-7, a two-seater vertical take-off and landing (VTOL) personal transportation vehicle… or in other words, a flying car. DeLorean Motor Company has the distinction of being one of the least successful yet most well-known vehicle manufacturers in automotive history due to the sole model it produced, the DMC-12. That vehicle played a starring role in the aforementioned Back to the Future trilogy. DeLorean Aerospace is an entirely different company that was created in 2012 by Paul DeLorean, nephew of John DeLorean who founded DeLorean Motor Company. John DeLorean died in 2005. As highlighted in a profile from Wired, the DeLorean DR-7 measures roughly 20 feet long, is 18.5 feet wide and features two sets of wings as well as a few winglets on the bottom. Two large ducted fans aid in lift and propulsion. Everything will be autonomous meaning users won’t need a pilot’s license to operate it. The DR-7 is still in the R&D phase although the company has constructed two scale models to date. A flying car may seem in the realm of science fiction and cliché given the DeLorean name but the truth is, several companies are actively developing flying vehicles. Safety, however, is still a key concern and ultimately could keep flying cars grounded for the foreseeable future.